In the heart of Tulum Real Estate! • 2023 sqft , 2 bath , 2 bdrm single story – FOR SALE USD412,300 . Pre-construction pricing won't last! 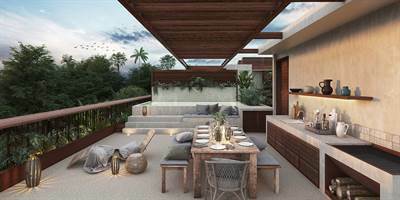 Brand new condos for sale in Tulum, Riviera Maya, Mexico. Aldea Zama is an eco-tourist residential development, located between the famous beaches and hotel zone of Tulum and the town. A planned community surrounded by nature and with a great projection which has made it the most exclusive area of the region. “Zamá”, which in Mayan means sunrise, is the name that was first given to the magical town of Tulum. Famous internationally for its extensive beaches of turquoise waters, the exuberant nature of the region, as well as the Mayan ruins that have become its best-known image, today it hosts more than 100 boutique hotels, a wide range of top-level gastronomy, and fantastic real estate opportunities. Tulum is located in the heart of the Mayan Riviera, 2 hours from the International Airport of Cancun, and 1 hour from the well-known Playa del Carmen; It is also the starting point for other important destinations such as Coba, Valladolid, Chichen Itza or Merida itself. These condos for sale in Tulum are a great turn-key investment opportunity that you can’s let pass! • 4744 sqft , 3 bath , 3 bdrm single story – FOR SALE USD698,500 . Pre-Construction Pricing Won't Last! Only 4 condos for sale at this Tulum real estate development! • single story – FOR SALE USD290,000 . Up to 19% ROI and pre-construction pricing! 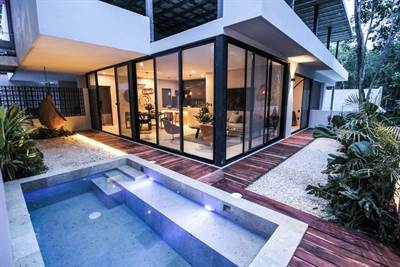 Brand-new 2-bedroom, 3-story penthouse condo for sale in Tulum. 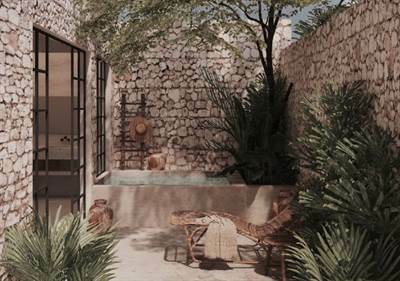 A truly beautiful jungle and expansive trees will frame this boutique Tulum real estate development which consists of four distinctive living spaces. Each apartment is unique, created to appeal to individuals with varying and distinctive tastes. 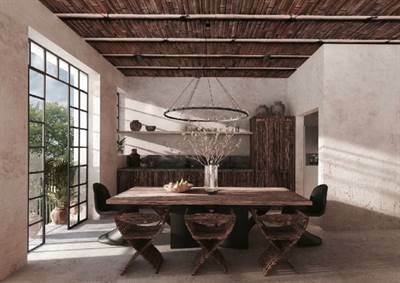 Besides the breathtaking nature and history in Mexico, these condos for sale in Tulum are inspired by the avant-garde and newest trends in architecture, interior design, and lifestyle in cities such as Ibiza, Mykonos, Milan, New York, and Marrakech. The center of this Tulum real estate development is the jungle. The concept of ascribing the same high value to both landscape design and architecture & construction is rare to be found in Tulum. The developers plan to keep and complete the beautiful, natural jungle with its existing trees and palms by adding great features such as a water fountain and numerous jungle plants. The different apartments offer various and unique perspectives on the jungle. Covered by the big Alamo tree and palms, penthouse Canopia is the hidden gem of the property. A wide staircase leads up to the living room with its high ceiling. The space is enclosed by large windows, connecting you to the nature outside and provides a tranquil atmosphere for the room. Textiles for the space are handpicked by the developers and are included in the unit. The dining room comes with a built-in dining table, designed by the same studio as well. The close-by kitchen area is an open, spacious room, and the very definition of luxury. Stairs lead you up to the first bedroom, a space that can be separated from the living room with retractable doors. 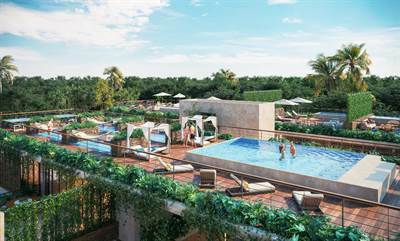 heart of this Tulum real estate development – the Alamo tree and the big rooftop terrace, with a luxury sitting area and pool. Welcome to the largest unit, the absolutely stunning Penthouse Canopia. Built-in sofas create a plush and welcoming atmosphere. The dining table bridges the living room with the kitchen, a bright and spacious facility. A conveniently placed half bathroom offers function while the wide stairway and significant wall space provide the perfect place to display stunning artwork. Madera is a tranquil and relaxing hideaway in the midst of the rustling created by its surrounding trees. The floor-to-ceiling window floods the room with light. The windows fully open and retract so the space easily transforms from a tranquil sleeping space to a bright and airy sunroom. Next to the bedroom is a full bathroom, which completes this level of the Penthouse Canopia. The third level of this Penthouse condo for sale in Tulum is the crown jewel of the property with stunning views of the surrounding greenery. The master bedroom comes fully equipped with an en-suite bathroom. Doors lead you out to the rooftop terrace which features the pool, as well as a cozy sitting area, perfect to watch the sunrise and sunset. The rooftop terrace draws on inspiration from the Mediterranean Islands, with warm colors and familiar textiles. This is a very special condo for sale in Tulum, featuring an excellent location and great amenities. Pre-construction pricing won’t last! Call us now for more information. • 796.53 sqft , 1 bath , 1 bdrm single story – FOR SALE USD150,000 . Up to 19% ROI and pre-construction pricing! Brand-new studio apartment for sale in Tulum. Studio Ramas is unique, almost nest-like in its design. Its entrance is out of sight, hidden by palms and trees that lead you to the entrance, but first, you must walk around the water feature amongst the sounds of chirping birds. This unit can be divided into a separate living area, with a fully functional kitchen and your bedroom, with the use of sliding doors. Additionally, the sofa can easily convert into a double bed. From the bedroom, you can see your green terrace with plants and the pool outside. A roomy bathroom and pool complete the space, which is connected by the terrace, separated by big windows. This open space is private, with trees providing seclusion and peace. This unit comes with handpicked textiles for the living room selected by the developers. Studio Ramas is a spacious apartment which includes a living area and 2 optional guest beds. The bedroom opens up throw the wide wooden door which showcases the jungle fountain and terrace, which is covered by two trees and palms to ensure privacy. At the beginning of the unit is the kitchen, centered on the ideals of practicality and minimalism while keeping its functionality. In the center, you will have a spacious living and lounge area followed by the bed. The whole studio features big windows to your very spacious terrace. • 1623 sqft , 2 bath , 2 bdrm 2 storey – FOR SALE USD275,000 . Up to 20% ROI and pre-construction pricing! 2-Bedroom penthouse condo for sale in Tulum, Riviera Maya, Mexico. Nido is a spacious two bedroom apartment and contains many social areas – a rooftop terrace where you can easily spend afternoons that turn into evenings enjoying the sitting area, taking a dip in the pool, or enjoying the sunset. The roof features a large master bedroom which includes a walk-in closet. Free flowing air helps provide a sense of calm and solace to this tranquil space. 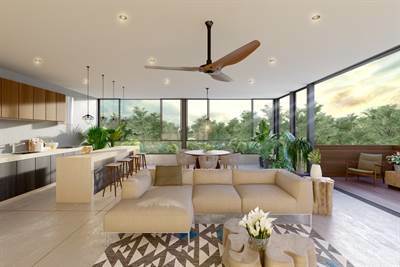 The open concept kitchen, dining and living room measures at approximately 45 m2 which makes it the ideal place to host dinner parties with breathtaking views of the Alamo tree in the background. The dining table is a custom designed piece by the developers and will certainly meet your needs. The living room will come with exclusive textiles designed by the developers in order to meet the exact specifications of the space. Next to this spacious entertaining area, there is a guest bedroom. Your guests will be delighted to wake up to the morning sun and green leaves dancing outside their bay window. Penthouse Nido is a wonderful 2-bedroom 2-level penthouse condo for sale in Tulum which offers comfort and style and provides an ideal tropical escape. Over the stairway, you enter the cozy living and kitchen area. Views of the trees will give this condo a tree-house feel. The inbuilt sofa and the big windows with a balcony will give you a luxury feeling. The master bedroom of Penthouse Nido comes fully equipped with an en-suite bathroom, walk-in closet, and plenty of natural ventilation – it is like sleeping in a luxurious tree house. Views from this room span across the trees, creating a unique feeling of privacy and freedom. Doors lead you out to the spacious rooftop terrace which features the spacious pool, as well as a cozy sitting area, perfect to watch the sunrise and sunset. The rooftop terrace draws on inspiration from the Mediterranean Islands, with warm colors and familiar textiles. • 1291.67 sqft , 2 bath , 2 bdrm 2 storey – FOR SALE USD255,000 . Up to 19% ROI and pre-construction pricing! 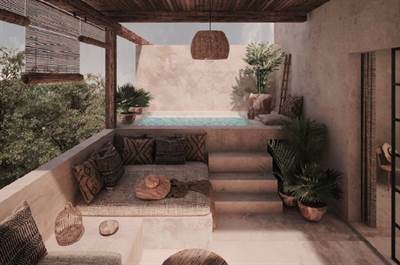 Brand-new 2-bedroom condo for sale in Tulum, Riviera Maya, Mexico. Casa Madera is a two bedroom condo for sale in Tulum that feels like a house and is inspired by the Madera trees that grow around it. This condo has a private terrace protected by a roof with a pool and looks down on the lush green jungle and Alamo tree. The high jungle palms serve a dual purpose; they create privacy as well as restful shade from the sun. The state-of-the-art kitchen comes with a fridge and stove, and a handcrafted kitchen table which has been exclusively designed by an international design studio. The basement features a half bathroom and plenty of storage space. The living room contains a comfortable and spacious built-in sofa, and the textiles of the pillows are hand chosen by the interior designers. A roomy stairway leads you back up to the first level where the two bedrooms are situated. Both provide plenty of space and bay-windows which allow you to experience the jungle while lying in the comfort of your bed. Casa Madera provides an exclusive terrace with private jungle views and a pool. From the expansive kitchen to the built-in sofa in a lounge living part with one-of-a-kind textiles, you will be living in luxury. The space is open and allows the full enjoyment of the jungle from the large windows. Walking up the expansive stairway, you reach the sleeping area of Madera. On the left, the master bedroom awaits with a serene and luxurious bathroom which opens up to the spacious bay- windows. On the right, there is a junior master bedroom with an en-suite bathroom and bay-windows to take in the peaceful Tulum air. • 2023.61 sqft , 2 bath , 2 bdrm single story – FOR SALE USD450,000 . Pre-construction pricing won't last long! To live in these condos for sale in Tulum is to live the beauty of paradise. These beautiful brand new Tulum condos for sale are located in the exclusive area of “Aldea Premium” within Aldea Zamá, with a contemporary design in harmony with water, earth, and forest, embracing the spirit of Tulum. You can be one of the first to take advantage of this great pre-construction pricing! Call us now for more information about these condos for sale in Tulum. • 1616.73 sqft , 1 bath , 1 bdrm single story – FOR SALE USD350,000 . Pre-construction pricing won't last! 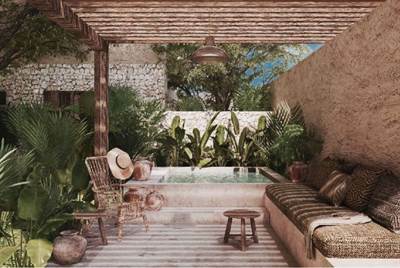 Townhouses for sale in the heart of Tulum! • 2516 sqft , 3 bath , 3 bdrm 2 storey – FOR SALE USD503,000 . Pre-Construction pricing won't last! Brand new townhouses for sale in Tulum, Riviera Maya, Mexico. Located within the luxury eco-chic gated community “Aldea Zama”, this new development features three different models and only 10 units in total, making it a truly exclusive Tulum real estate investment opportunity. All condos and townhouses are 2-story and are connected by a lush jungle garden that provides privacy and fresh air. *Private Pool in each unit. Aldea Zamá is a large ecotourism development that reflects modern life in the Mayan Riviera. It offers quality Tulum real estate and exceptional amenities such as a shopping area, cinema, pet-friendly integration zone, and organic shopping stands to support local businesses and art. The private residences and condominium places are designed to preserve the natural richness of the area. Be one of the first to take advantage of these great pre-construction prices. Call us now for more information about these townhouses and condos for sale in Tulum. • 2027 sqft , 2 bath , 2 bdrm 2 storey – FOR SALE USD497,000 . Pre-Construction Pricing Won't Last! 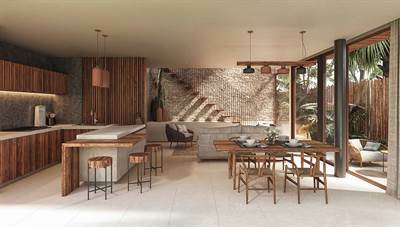 Brand new townhouses, and penthouse condos for sale in Tulum, Riviera Maya, Mexico.